Product prices and availability are accurate as of 2019-04-21 17:35:57 EDT and are subject to change. Any price and availability information displayed on http://www.amazon.com/ at the time of purchase will apply to the purchase of this product. IMPORTANT: *** THIS DVD WILL NOT PLAY ON STANDARD REGION CODE 1 USA DVD PLAYERS. 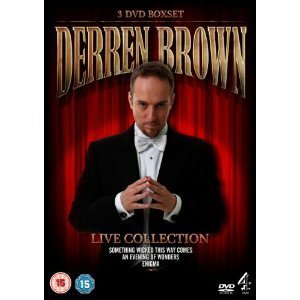 This DVD is REGION 2 format and you need a region free (aka multi region) DVD player to watch this in the continent of north/south America, Australia, Africa and Asia *** SOUNDTRACK: English *** SUBTITLES (on/off): English *** SUMMARY: Psychological illusionist extraordinaire, Derren Brown brings his mind-bending powers to the stage for this collection of live show; all of which fuse Derren's established sleight-of-hand trickery with impressive feats of memory, and astonishing stage theatrics. Includes AN EVENING OF WONDERS, SOMETHING WICKED THIS WAY COMES, and ENIGMA.